Adults and children transforming their lives through employment and life skills training. This month one of our young adults had the opportunity to go shopping at The Green Chair Project to purchase furniture for her family. Keshondra Montague is an amazing young Women who started our Real World Program last June. When she came to Step Up she had already completed High School at the age of 16 and she had a list of goals for what was next in her life. She is now enrolled at Wake Tech and continues to work full time. 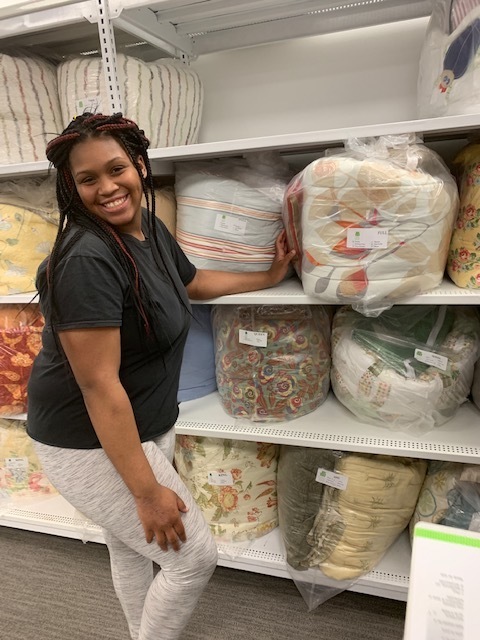 One of her goals was to save money and get furniture for her family, and just like many of her other goals she was able to achieve that goal! To return to the newsletter, click here. On December 5, we had one of our favorite events of the year called “Santa’s Workshop”. During this event we transform the Gym at White Memorial into the ultimate shopping experience for our youth. The nursery, the children’s program, and the Real World program have the opportunity to come and shop for their parents and loved ones. This year we had a large selection of new and gently used items for them to choose from thanks to donations from the community. After shopping, they head over to the gift-wrapping stations to put a special touch on their gifts. 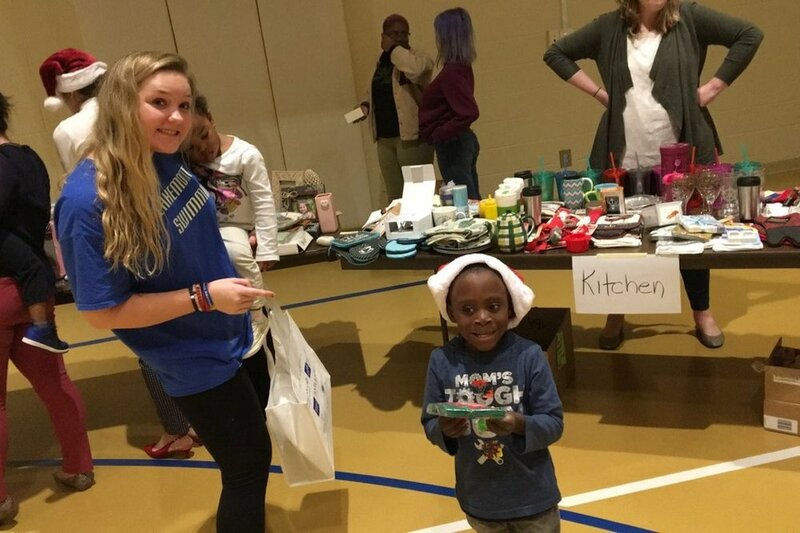 The Junior League of Raleigh also had holiday craft stations set up for the kids to partake in after shopping. This event brings so much joy to the children of StepUp because it gives them the opportunity to give something special to the ones who care for them all year long. On September 11, the Real World took time to reflect on the events that took place 17 years earlier on September 11, 2001. The group had some deep conversations on what they knew and how they felt about such a hard time in our country. Nathiel Key, who has done workshops with both The Real World and the Children’s program in the past, lead this conversation while teaching the young adults some painting techniques. They had the opportunity to put their own spin on a patriotic picture of New York City when the Twin towers were still standing. Though the topic of the night was heavy it was a fun evening! Stage Talent? We've got it. ...well, our StepUp kids do at least. After an exciting summer of fun for our StepUp children, they are getting back into the swing of the school year with acting classes taught by NC Theatre Conservatory. The Children’s and Real World programs invited NC Theatre Conservatory to come and work with our children on acting skills. We have so many talented young people in our program, so it was not hard for any of our children to come out of their box! We are so excited to have NC Theatre Conservatory come and teach our children and we cannot wait to see what else they have in store for us this month! The Real World program seeks to empower young adults throughout Wake County through professionalism and employment coaching, communication skills, positive decision-making, and encouraging post-secondary education. Recently, the Real World invited the Raleigh Police department and two Wake County district court judges to a panel discussion moderated by StepUp Ministry’s very own Elizabeth Butler. Students asked questions regarding proper conduct in the courtroom and how to have safe interactions with police officers. The officers and judges shared testimonies about some of their experiences on the job and what motivated them to choose their careers. Students and panelists felt that the conversation was a step in the right direction for police and community relations. To return to newsletter, click here. The work we do at StepUp is difficult and can be stressful. In the midst of that difficulty, we have dedicated volunteers, like Mr. George Ramsay, who are a stream of support for both staff and participants. He was involved in the creation of the Real World and has assisted hundreds young adults through his years of service in the Real World. He has inspired young adults to follow their dreams, to think about their finances and to make choices that are based on the details and not their current life situations. He has aided staff in teaching and developing curriculum, and has served as a positive role model for all! Mr. George, as you leave your position as a copartner in the Real World, we want to thank you for all the hours of service and dedication you have provided to StepUp Ministry. Your consistency and calming presence will be missed on a weekly basis. This will be brand new territory for the Real World, but we are sure with the lessons you have taught, we will be successful. Thank you for all your hard work!